Bandicam Video Converter makes it possible to convert video files to AVI (MPEG1 Video/MP2 Audio) files for Bandicam Video Library. It uses FFmpeg ( Unofficial FFmpeg Win32 Builds) and MediaInfo. 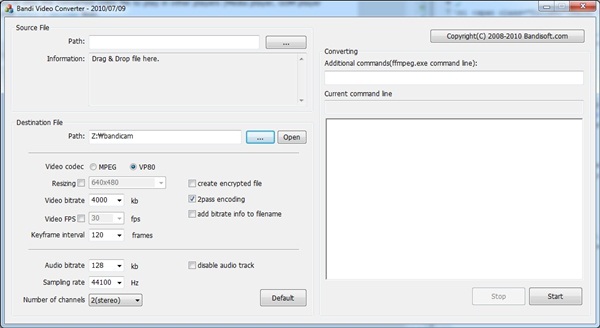 Bandicam Video Converter is freeware (GPL). It can be used without any limitations. If you want to get the full source code, e-mail us at support@bandicam.com. If you want to play the converted video file, install Bandicam MPEG-1 decoder. You may try Bandicut Video Cutter. Bandicut is super-fast video cutting/joining software with an easy-to-use interface. It allows users to trim parts of video quickly while keeping the original video quality.